IT IS redemption round this weekend as some teams look for some payback from their previous encounters. On Saturday, Palmerston faces the Queen Ants, who defeated the Magpies in their first match by three points. However, with the Magpies’ current form, they will be heavy favourites to rectify that loss. On Sunday morning, Nightcliff plays St Marys, where the Saints will be looking for a decisive victory over the Tigers. At Gardens Oval, Tracy Village and the Wanderers meet in an intriguing encounter. The Razorbacks have been scoreless for two weeks in a row, while the Eagles will attempt to build on last week’s victory. At the same time on Sunday, TIO Stadium will host the Darwin Buffettes and Southern Districts. In their last match, the Crocs shocked experts by downing the Buffs in a close game. The Crocs have been on fire recently, but Darwin will be no easy team to beat. The Magpies have shot into finals form in the past month. Their under 18s representatives, Tabitha May, Janet Baird and Freda Puruntatemeri have been heavy contributors for the Magpies this year. It seems that Palmerston has built a culture of youth that is reaping its rewards from every game. That is not to overshadow Natasha Medbury’s efforts, who is now ranked third for goals despite being predominantly a midfielder. Medbury will be Pint’s greatest challenge, and tagging her is a must in this weeks match. Queen Ants rovers, Erin Hetherington and Katie Streader will have to shake off their horrific performance last weekend and get busy in the clearances. If the Ants can deny the quick pace of the Pies through the middle of the ground, they may be able to free up forward, Kristen Smits to put some real hurt on the scoreboard. St Marys was competitive in the first half against the Magpies, but could not sustain a four quarter effort. This weekend, the Saints go up against the bottom of the ladder Tigers, who remain winless in another poor week. The Saints clearly have the advantage. Star, Danielle Ponter may be pushed forward as Simone Garner and Natasha Dunn-Richards may prove more than enough for Nightcliff’s rovers. Ponter is a proven goalsneak and with her class, and she may threaten to tear this game apart. If the Tigers have any chance, they will have to bypass Saints defenders, Nikita Long and Lori Nevan. This will be no easy task for the Tigers, as they have been screaming for somebody to stand up and lead them to a victory. This match is hard to predict. The Wanderers have been competitive recently but the Razorbacks have been in real strife. Although Tracy Village’s position on the ladder is higher than the Wanderers, the Eagles have momentum heading into this game. Eagles spearhead, Lee-Anne Alia nearly kicked a bag last weekend, and under 18 representative Arthurina Moreen kicked a pair of goals herself. This deadly alliance up forward may be enough to rattle the Razorbacks’ defence and prove the difference in the game. Tracy Village superstar, Kristy Irvine had a quiet match against Waratah, so she will need to find a new gear if the Razorbacks are to defeat the Eagles. Second plays fourth as the Buffettes take on the Crocs in what should be an epic encounter. In Round 1, Darwin had a 10-point lead going into the final quarter, but a late surge by the Districts caught the Buffs off guard for an upset win. This game is a toss of the coin. The Buffs have the experience but the Crocs have been smashing teams of late. 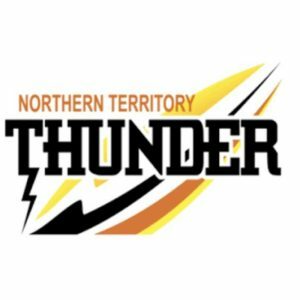 In the centre of the ground, Southern Districts’ Tahlia Holtze, Ebony Miller, and Lateesha Jeffrey will try to combat Darwin stars, Tikesa Docherty Cole, Jemma Iacono, and Kylie Duggan. Up forward, Darwin has an arsenal of goal scorers, with Machaelia Roberts and Meredith Turner being the most dangerous. The Crocs will need to lock down this pair in order to settle their back line. The Southern Districts’ forward line, on the other hand, is another story. The Crocs have proven to be inaccurate in recent weeks, but it is yet to come back and haunt them. Perhaps this could be the game where it does. SOUTHERN Districts headlined Round 7 with a big win over reigning premiers, Waratah. The win helped the Darwin Buffettes edge closer to the top of the table, as they got a win over Tracy Village. But the team that has surpassed them all is the Queen Ants, after securing a big win over the Wanderers to cement them as one of the favourites to take home this season’s Northern Territory Football League (NTFL) Women’s premiership. Darwin: M. Breed 2, T. Hart-Aluni 2, T. Docherty-cole, B. Stokes. The Darwin Buffettes continued their strong season with a win against the Razorbacks, getting over the line by 34 points. The game was even at the end of the first quarter, with just one goal separating the two sides. Then, the Buffettes kicked away in the second quarter, outscoring Tracy Village three goals to one behind to take a 25-point lead into half-time. In the third quarter, the Razorbacks were able to peg the margin back, kicking a goal to match Darwin’s one goal for the term. However, the second quarter repeated itself in the last term, with the Buffettes again holding the Razorbacks to just one point. Darwin had two multiple goal-scorers on the day, with Mattea Breed and Tayla Hart-Aluni both kicking two majors. Tikesa Docherty-Cole and Bianca Stokes were the other goal scorers, and they were also named in the best. Tracy Village’s only goal scorer was Elissa Ienco, and because of her efforts, she was named second-best. Zhoe Clarke played her best game for Tracy Village, as she was awarded best-on-ground honours for her side. Palmerston: J. Baird 3, T. Parriman, M. Singh, H. Davey, N. Medbury. Nightcliff’s woes continued against Palmerston in Round 7, going down by 52 points to the in-form side. The Magpies didn’t get off to an immediate flyer, scoring just the one goal in the first term. They followed this up with a three-goal second quarter, all while holding Nightcliff scoreless, giving them a 32-point lead heading into the main break. The Tigers broke even in the third term, with each team only scoring one behind. But the Magpies were able to make amends in the fourth quarter, outscoring the Tigers three goals to none. 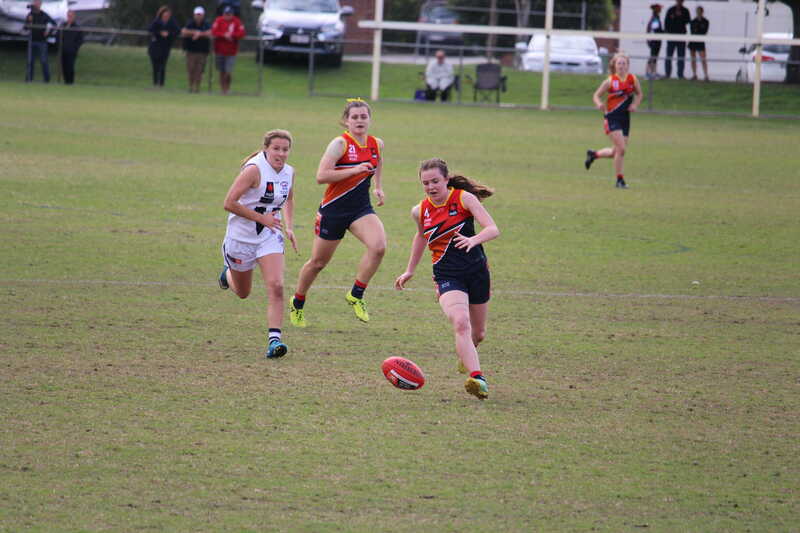 Northern Territory Under 18 representative, Janet Baird starred inside 50, ending the game with three goals next to her name. She was complemented by a goal each from Tania Parriman, Marijian Singh, Hayley Davey and Natasha Medbury. Tabitha May, who was named Northern Territory’s Most Valuable Player (MVP) at the AFL Women’s Under 18 Championships, was named best-on-ground for the third time this season, highlighting her stunning form for the Magpies. Charmaine Marshall, Jess Leamey, Vanessa Mounsey and Billie Byers were the other players who impressed for Palmerston. Southern Districts: T. Holtze, K. Patterson. Waratah: S. Nalder, L. Miceli. Southern Districts have pulled off the upset of the season, defeating reigning premiers, Waratah by five points. The game was tight throughout, with scores being level at a goal a piece at the end of the first term. Going into half-time, just one point separated the two sides, with the Crocs only managing to add one point to their score to take that slim lead into the main break. In the third quarter, the Southern Districts broke the scoring deadlock with a crucial major to extend their lead to nine points heading into three-quarter time. In the last quarter, the Warriors fought back with a major, giving them a chance to wrestle back the momentum. But somehow the Crocs managed to hold on, despite only scoring two behinds in the last quarter. Usual names, Kelsey Patterson and Tahlia Holtze were the Crocs’ goal scorers, continuing their marvellous seasons inside 50. Usual names were also the trend for Waratah, with NT Thunder’s Sue Nalder and NTFL Women’s leading goal scorer, Lisa Miceli getting the Warriors’ majors on the day. Experienced NT Thunder star, Lisa Roberts led the way for Waratah, while Joanna Kolodziej, Claudia Fabris, Pippa Cox and Sharona Bishop were also solid. Pint: M. Keeble 2, M. Gunn, K. Smits. Pint continues to charge towards victory in season 2018/19, cementing a spot on top of the ladder with a win over the Wanderers. The Wanderers were able to halt Pint’s scoring in the first term, with neither team managing to kick a goal. Then the Queen Ants got going in the second quarter, outscoring the Wanderers two goals to none. Coming into the third quarter with a 13-point lead, Pint failed to really put a dint into the margin, kicking just the one goal in the third term. The Queen Ants tried once again in the last term to boost their percentage, but their inaccuracy came back to haunt them, as it has done on many occasions during this season. Pint managed just one goal from seven attempts in the last term, but this couldn’t prevent a fifth victory for the home side. Madeline Keeble showed good form up forward, kicking two of Pint’s four goals. The other goal scorers were Mellissa Gunn and Kristen Smits. Despite no goal scorers for the Wanderers, Sophia Mauboy, Lauren Motlop and Pierre-Angelique Koulakis were solid in the 29-point loss.